Efficient management of Active Directory is impossible without knowing and controlling what is happening in the system. This makes change management of Active Directory one of the most critical processes for organizations today. 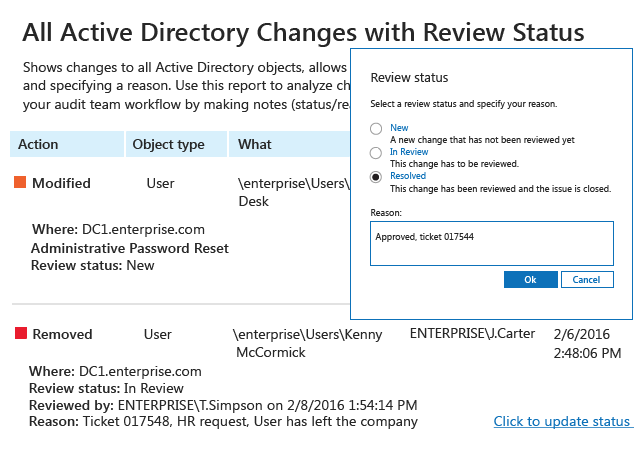 In addition to planning, requesting and implementing changes to Active Directory configuration and Group Policy objects (GPOs), organizations need to be able to evaluate all changes, which requires an established Active Directory change control process. While native auditing tools can capture changes in AD, they fall short in providing the complete visibility required for effective Active Directory change control. In particular, they fail to consolidate events from multiple domain controllers, and they lack reporting capabilities. Netwrix Auditor for Active Directory facilitates Active Directory change control process by automating Active Directory change tracking and reporting. Administrators can easily see who made a change, when the change occurred, and what exactly was changed, including the before and after values. This helps keep all changes made to AD and GPOs undertight control. Additionally, Netwrix Auditor enables IT staff to review the changes in AD and add notes right in the report. For instance, a system administrator can assign a ticket number to a particular change, update its status, and document the reason why the change was made. This makes Netwrix Auditor reports exceptionally useful in the Active Directory change management process. Netwrix Auditor also enhances control over changes in AD by providing a change rollback and object restore capability that overcomes the limitations of the native Active Directory Recycle Bin or Active Directory tombstone. In the case of a malicious or incorrect change, system administrators can quickly revert the Active Directory configuration settings to a previous state without any downtime.